HATTIESBURG, Miss. --- BAE Systems has received orders worth around $118 million (£70 million) for 63 more M777 howitzers, taking the order total to exactly 800 guns. The U.S. is buying 38 guns for the Marines and Army while Canada is acquiring 25 more through the U.S. Foreign Military Sales program to add to the 12 it already has in service. BAE Systems Global Combat Systems’ facility at Hattiesburg, Mississippi is responsible for final integration and testing of the weapon system. The prime contract management of the M777 program and manufacture and assembly of the complex titanium structures and associated recoil components are undertaken at Barrow-in-Furness in the United Kingdom. Global Combat Systems has also received a $3 million contract to ‘reset’ 33 U.S. howitzers returning from operations in Afghanistan. This refurbishment work will be undertaken at the Hattiesburg facility. “The purchase of additional howitzers is further endorsement of M777 and we expect more orders through 2009. We are also looking forward to establishing long-term partnering arrangements with U.S. Government military depots to undertake future reset and overhaul activities,” said Ian McMillan, Global Combat Systems’ Artillery Program Director. 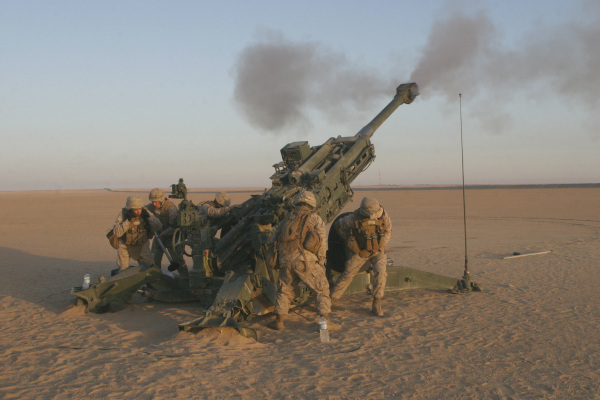 Weighing in at less than 4200kg, the revolutionary M777 is the world’s first artillery weapon to make widespread use of titanium and aluminum alloys, resulting in a howitzer which is half the weight of conventional 155mm systems. Both the U.S. and Canada operate M777s in Afghanistan, providing fire support to coalition forces. Its ability to be airlifted to remote positions by helicopter gives the system enormous operational flexibility and makes it ideal for a challenging environment like Afghanistan. The M777 can fire the “smart” Excalibur round, co-developed by Global Combat Systems up to 40 km (25m) accurately enough to target individual rooms within a building, reducing the chance of innocent casualties and allowing supporting fire to be brought down much closer to friendly troops. The M777 effort is managed by the Light Weight 155mm Joint Program office at Picatinny Arsenal, New Jersey. BAE Systems is the premier global defense, security and aerospace company delivering a full range of products and services for air, land and naval forces, as well as advanced electronics, security, information technology solutions and customer support services. With approximately 105,000 employees worldwide, BAE Systems' sales exceeded US $34.4 billion (£18.5 billion) in 2008.